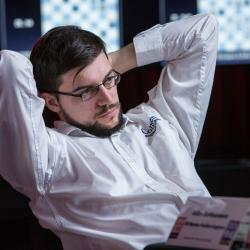 Maxime Vachier-Lagrave, also known as “MVL”, is the premiere player from France. He is a prodigy who became a Grandmaster before he was 15 years old. Having recently hit a rating high of 2766, the sky's the limit for this young talent. Also a great blitz and bullet player online, he is an accomplished player at both the rapid and slow chess time controls. Hailing from France, Maxime Vachier-Lagrave is a wunderkind who became an International Master in 2004 at the age of 13. In 2005, at the age of 14 years and 4 months, he was given the Grandmaster title. He has won many tournaments in his short career and has also crossed the 2700 rating barrier, recently peaking at a rating of 2766 in July 2014. He is the premiere player from France, having played in, and won, many of the age categories of the French Championships as well as winning the adult versions of the tournament as well. Though he has yet to get to the same level as Fabiano Caruana and Magnus Carlsen (two other young players born in the same year as Vachier-Lagrave), he is still on track towards being a World Championship challenger, being ranked among the top players in the world at the moment.